Is the theory of peak oil demand any more credible than its supply-side cousin? Peak oil has been in the news again over the last week, but this time in relation to the theory of peak oil demand. 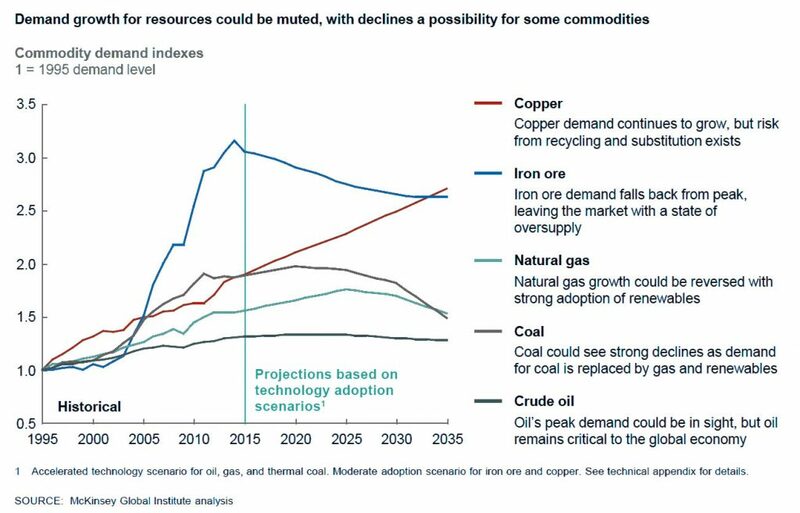 This recent report by the McKinsey Global Institute, explores a number of potential long-term themes that it believes will be driven by technological change, including the notion that by 2035, we may have seen peak in global demand for oil. 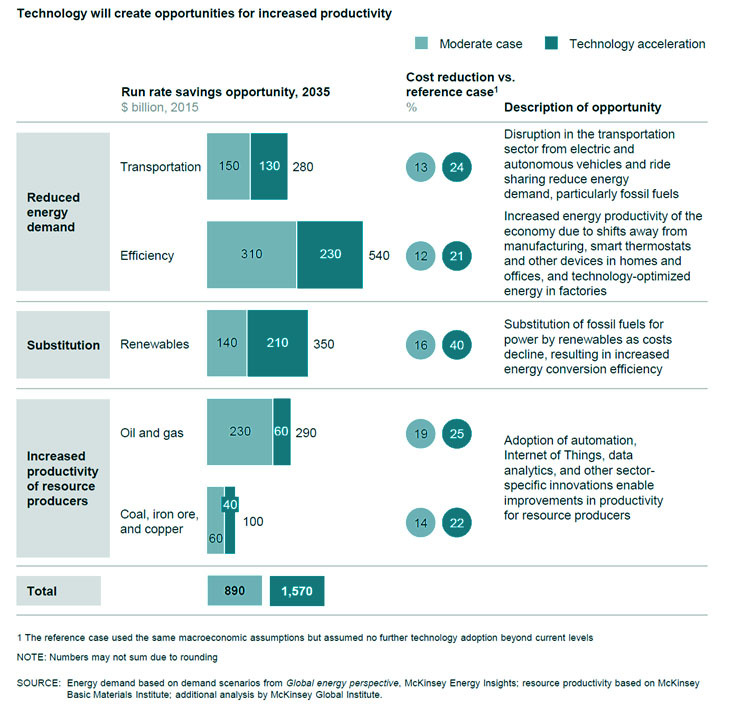 McKinsey argues that as the main driver of oil demand is the transportation sector, representing 56% of total primary oil consumption, the growth of electric and autonomous vehicles and ride sharing combined with ongoing improvements in fuel efficiency could see demand growth peaking in around 2025, and being 2% below its 2013 level by 2035. It also believes that technological advances are likely to contribute to reduced oil demand by heavy-duty vehicles and aviation, driven by improved aerodynamics, technology-driven “platooning” (where a line of vehicles closely follow one another to reduce drag) and the use of telematics to optimise fleet performance. McKinsey also identifies some second order effects from the technology-driven changes in light vehicle usage. As ride-sharing increases, so the demand for cars would reduce, leading to a corresponding reduction in demand for oil as a feedstock for the production of plastics. McKinsey’s views are shared by some of the oil majors. According to the Financial Times, Shell believes the peak may be reached as early as the late 2020s, while Statoil has suggested it might be anywhere between the mid-2020s to late 2030s. 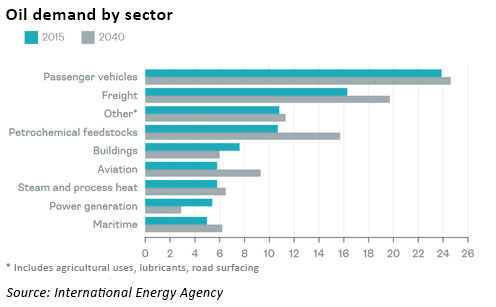 The surge in battery-powered vehicles will cause demand for oil-based fuels to peak in the 2030s, Total’s Chief Energy Economist, Joel Couse, was reported by Bloomberg as saying that the growth in EVs will see peak oil demand in the 2030s. However others disagree. The International Energy Agency predicts oil demand will continue to grow unto the 2040s and beyond, while Chevron and BP have also expressed doubts. John Watson, chief executive of Chevron reportedly described forecasts of impending peak oil demand as “wishful thinking” while BP’s chief economist, Spencer Dale, is doubtful that electric cars alone will have a game-changing impact on oil demand. The CEO of Saudi Aramco, Amin Nasser, also disagrees with the peak oil-demand predictions, pointing out that the global economy is forecast to doubly by 2050 leading to higher energy demand. He described the peak-oil demand forecasts as “equally as mis-leading” as the now discredited theories about the peak supply of oil. Recent forecasts from the IEA show overall oil consumption growing into the 2040s, however its data already indicate that demand for oil in some sectors is already falling, including in the important passenger vehicle segment where oil consumption by cars is expected to fall by 600,000 barrels per day, albeit that this will be offset by increased demand from buses and motorbikes. A lot depends on the actions taken by governments to reduce greenhouse gases and other emissions. On the one hand, the election of Donald Trump may be seen as expansive for oil, while on the other hand, if governments act to limit atmospheric greenhouse gas concentrations to around 450 parts per million of CO2 the oil demand could fall sharply. The IEA has consistently under-estimated demand for renewable energy sources, and may well also be under-estimating the growth in self-driving cars. However some commentators have suggested that the growth in autonomous vehicles will increase oil demand rather than reduce it…in a world where active driving is no longer needed, more people may undertake car journeys than might otherwise have been the case. Self-driving cars may also be programmed to drive empty, collect people from various locations or to find parking spaces, potentially displacing other modes of transport. Furthermore, although battery technology has improved significantly in recent years, batteries still do not offer the full functionality of a petrol or diesel car, meaning that without subsidies and other inducements it’s difficult to see demand growing to the extent of the more ambitious forecasts. Energy economist Michael Lynch argues that claims of peak oil demand are no more credible than previous theories of peak oil supply. Social mobility may also be a relevant factor – as most people globally have yet to join the middle classes, significant increases in demand for oil and derivative products can be expected. EVs and other technologies still have some way to go before they would be a natural first step for new car ownership in developing countries, with a lack of charging infrastructure creating additional barriers to adoption. Energy demand may have become decoupled from GDP growth in some developed regions but there’s a long was to go before this is the case everywhere. Expectations of peak oil demand in the next couple of decades suggests a change in trajectory that is not, so far, justified by the data. Like it’s supply-side cousin, the theory of peak oil demand could well turn out to be just as overblown. A wonderful collection of the views of narrow specialists none of whom understand the other persons speciality and none of who seem to take any holistic view of society or the economy. Fossil demand will fall when the price – the true price, rather than the government interfered with price – exceeds the cost of the next most suitable alternative. That’s basic business economics 101. And real price is massively related to EROEI – energy return over energy invested. That represent ultimately ‘as good as it gets’ in economic payback terms. Of course you can top load that with bureaucratic regulation to increase cost, but you can’t get below that basic cost. The whole goal of the rent seeking ‘new energy’ community is to profit not by being the next most suitable alternative, but by being government mandated. That can only work with a world government that can enforce a unilateral energy policy across the world however, otherwise the reality is that e.g. China will simply burn fossil fuel and undercut every other countries energy costs and become the manufacturing centre for the whole world., which would be OK, except in the end, what can we offer in return? Windmills? In real terms a few weeks of research and holistic calculations shows that the only viable alternative to fossil fuels to maintain a western style post industrial society, is in fact nuclear power. If the fragile coalition of interests represented by various faux ‘climate treaties’ falls apart or is ignored, and the nation state reasserts itself as the most efficient way to meet the challenge of changing conditions, then a competitive free market will re-establish itself and those that have nuclear power will be at a competitive advantage whilst those covered in windmills, will not. You don’t need to be a genius to work this out, just a decent engineer with some exposure to holistic systems analysis and cost benefit analysis and the ability to count beyond ten without taking your socks off. Ah. I forgot. No one mentioned in the article has all of those attributes, do they? The oil company buffs come closest: they understand that in real terms the [energy] cost of oil and gas extraction has risen and will continue to rise, and at a given point even bureaucratically hobbled nuclear power will simply be cheaper [in total energy terms]. But renewables costs will not fall if the energy costs of the energy needed to build the plant continue to rise with fossil fuel prices! The real root of all these issues is not in fact the actual engineering realities, but rather the growth of an elite who have taken the underlying physical infrastructure of post modern post industrial society for granted, and have instead focussed on what amounts to social propaganda and the creation of emotional narratives about society, and the earth, that have been remarkably effective at capturing the imagination of the populace, but massively counter productive in representing how the world actually works. The net result of this is that the very infrastructure on which civilisation depends, and indeed the elites who seek to control the masses too, is at risk from their staggering incompetence. It’s one thing to shower the sheeple with propaganda, but it behoves one not to end up believing it oneself. Nuclear power works, and is cost effective overall. Heat pumps work, and if electricity is cheap enough, would be competitive with fossil fuel heating in most space heating applications. Insulation works, but the low hanging fruit has been plucked in most domestic new builds. Ex of heat recovery ventilation or suffocating the occupants, its about ‘as good as it gets’ now. Electric cars only work in a limited context, and electric aeroplanes are a long way off. The actual energy density of the best electrochemical constituents show that the theoretical best battery (lithium air) is only JUST viable for aircraft, and although it would be good enough for cars. No one knows how to build a practical safe usable or affordable lithium air battery yet. No grid scale storage apart from pumped storage exists to store intermittent electricity generated by intermittent renewables for sufficient time to be useful to counteract e.g. seasonal solar production that is in anti-phase to seasonal electricity demand.. Nor is there any technology that when calculated looks remotely capable of meeting the requirements. Certainly not safely or economically. What this means in practice is that the roll out to a fossil free future will not involve renewable energy at all. And although our hydrocarbon fuels in future may not be fossil in origin, the fact remains that hydrocarbon fuel even if fully synthesised by nuclear derived primary energy are a monumentally good [portable] energy storage medium that we have the infrastructure to use and distribute. And the switch to synthetic fuel will happen as rule 101 says, when the cost of fossil fuel in energy extraction terms exceeds the cost of synthetic fuel made from nuclear power, in energy terms. Renewable energy will die because rule 101 says it will always be more expensive in energy terms than nuclear. Now that doesn’t stop governments mandating its adoption BUT the catch there is, unless it’s all governments, other governments in e.g. the far East may say ‘what we need is cheap reliable energy, and that’s nuclear’; and undercut the West in terms of cheap energy (if not virtue signalling). I.e. in the final analysis, governments that are using energy as an instrument of social and political propaganda, do so at their own peril: If just one large nation breaks ranks and does the sane thing from the perspective of actually building infrastructure that works., the house of cards comes down, and all the governments involved in perpetuating the myths of renewable energy are immeasurably weakened. China only pays lip service to ‘climate issues’. Its the biggest builder of nuclear power right now. Russia openly derides AGW. Its economy depends on gas exports. It is currently expanding its nuclear base and exporting its nuclear technology. The USA has elected a President who is quietly dismantling the climate propaganda machine and seems to be encouraging coal and fracking. Saudi Arabia, once home to the greatest oil reserves known to man, is building nuclear power stations. As is the UAE. It seems that the people who have their own oil drilling and gas drilling are the ones who can see the writing in the wall and are deploying nuclear power. Only Europe with very little fossil fuel left to extract, and the USA are in the van of driving ‘renewable energy’. Peak oil will come eventually. And quite gradually. It’s not something to get excited about, any more than ‘peak horse’ or ‘peak canal’ were in transport. At a given point other technology simply became cheaper. What is far more worrying is the fact that in Europe – especially the political class – have played fast and loose with energy policy for the purposes of social and political propaganda, crony profiteering, and virtue signalling to gain political control. This may turn out to be a Pyrrhic victory if the society they now control is unable to sustain itself due to their policies. Which is probably as apt a description of where modern progressive socialism takes you as anything else. I agree with a lot of what you are saying. My point in this blog was to highlight the over-excitement that pops up every now and again – drama about peak oil supply, now more drama around peak oil demand (and of course the on-going dramas around renewable technologies saving the world). Much of this drama is accompanied by a deafening lack of credible analysis. Peak oil demand may happen one day, but beyond the horizon of what can currently reasonably be forecast. It might be that in isolated cases, governments may act to cut local consumption, but as you say, this is unlikely to translate into a global drop in demand, due to a range of conflicting agendas and demographic trends.